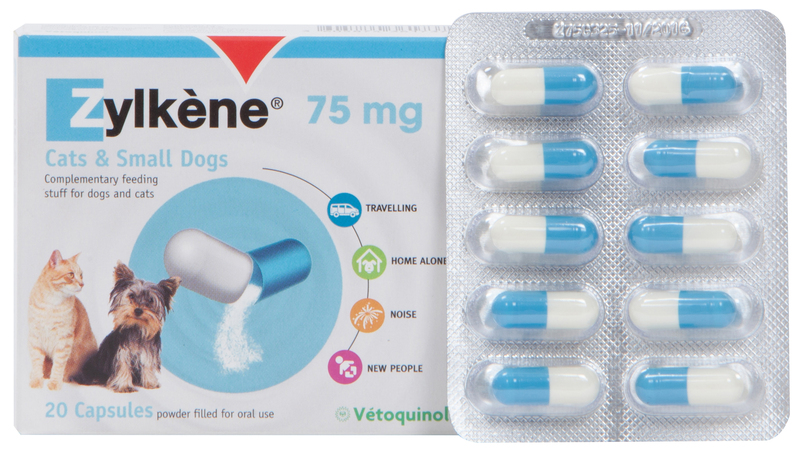 Zylkène is a product that can help support dogs and cats in situations where they find they need to adapt their behaviour to cope. These include kennel and cattery stays, house moves, arrival of a new pet or baby, sudden noises e.g. fireworks, travel, vet or groomer visits and Christmas festivities. There are many ways our pets can respond to new and unpredictable situations and not all animals respond in the same way. Zylkène is palatable and easy to give; simply mix with food or give as a treat. Give just once a day. Zylkène is preservative and lactose free. Zylkène is a complementary feed for cats and dogs which contains a natural product, derived from casein, a protein in milk. It is a molecule well known to promote the relaxation of newborns after breastfeeding. Ideally Zylkène supplementation should be started a few days before required, for example before the fireworks season begins or before a kennel or cattery stay.